By following pre-determined paths located in public places such as airports, shopping malls, museums, etc, visually impaired people can move independently in unfamiliar environments. arianna (patented) is a flexible, low-cost navigation system which can be used in any indoor environment (airports, museums, hospitals, shopping malls) and outdoor (stations, sidewalks, etc. ), and can provide localization information to any person (including non-blind people) because it is based on the use of an electronic device as pervasive as smartphones. The low cost and ease of use are key aspects to make the system accessible to all and guarantees a rapid dissemination. Thanks to arianna, the visually impaired can increase their independence and social inclusion. Such as tactile paving, arianna allows the visually impaired people to move from one place to another in a very easy, the advantages of the system are varied. The managers of the places easily install the strips, reduce cost of the environment and provide users with an interactive and easily configurable, the system can be added many additional services. 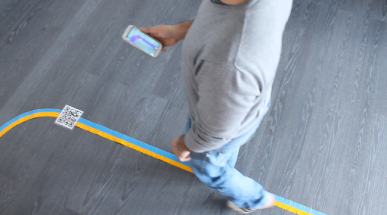 The arianna system works as follows: the camera of the smartphone continuously captures the scene in front of the person and identifies the path by recognizing special colored strips painted or sicked to the floor. The user receives a vibration signal through his cell phone. The vibrations are related to the position and direction of the user and allow him to understand the direction to follow and the presence of path variations. 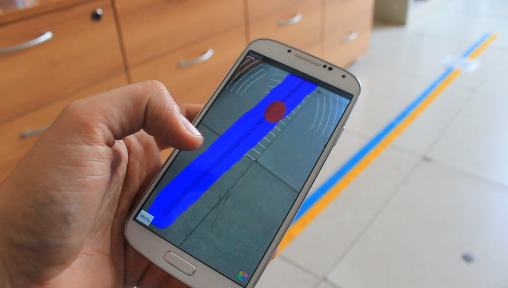 The system combines sensors and interfaces present on commercial smartphones to guide the visually impared in an effective way, even in unknown environements. 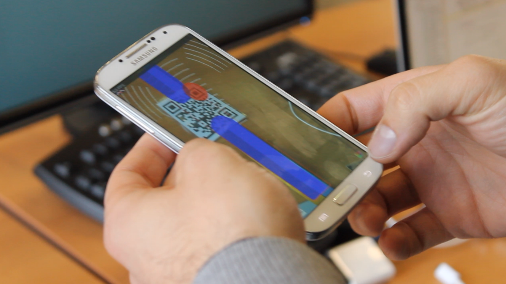 Some special labels, such as QR codes, could also be deployed along the path for coding additional information detectable by the camera. A network infrastructures (3G, WiFi, etc.) can provide localization information, correlation between paths and points of interest, routing towards destination and to allow flexibility in the building topology and its deployed paths. Private entities: eg. shopping malls, fairs, exhibitions, resorts, HoReCa, amusement parks, factories, markets, etc. arianna attempts to answer a fundamental question: is it possible for a visually impaired, thanks to technology and science, to live an independent life, work and socialize? arianna allows people to move autonomously in an unknown environment, to retrieve information about the places where he is and to receive personalized updates and real time notifications on nearby locations. This is a great opportunity and a significant support to the visually impaired people. The above figure shows three different screenshots of the Arianna application. It can provides different functionalities, two examples are: i) Follow the line and return POI (Point Of Interest) notification; ii) Navigation from a initial POI to a destination POI. Moreover, we can design and develop any functionalities according with the customers needs. 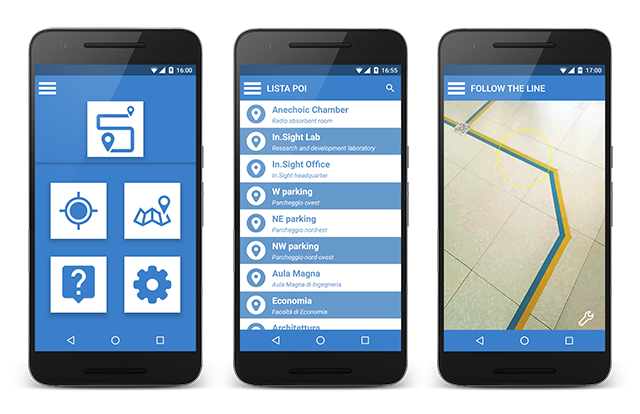 This is the main In.sight product, we are proud to present our smartphone-based navigation system for visually impaired people.